VITROHM was founded in 1933 and became a part of the Yageo Group in 1996. VITROHM manufactures resistors with a wide range of applications, such as wire wound, SMD, Low OHM, Meta Glaze, and high-power wire wound resistors. VITROHM currently has approximately 200 employees with production sites in China and Portugal. IBS Electronics is a VITROHM authorized distributor. As an ISO 9001:2008 certified distributor of electronic components, you can trust IBS Electronics to offer you the best prices on VITROHM components. We take pride in our unmatched level of quality assurance, ensuring your components are original and promptly shipped. For low-to-medium rated power (1W…8W), VITROHM offers wirewound resistors. These resistors are coated with a special silicone-varnish that continuously withstand temperatures of 350°C. Series CRF is designed for safety applications, connected to mains-voltage. For medium-to-high rated power (4W…40W), resistors are mounted in a ceramic case, which also provide full electrical insulation. Series KT and KF additionally provide a thermofuse, which interrupts a circuit in the event of electrical overload. Axial, radial and vertical styles are available. Series BW and BWF, wound on fibreglass core and capped in a special process, suit all requirements for automatic insertion due to moulded case. The accurate fusing characteristic of series BWF reliably protects circuits from electrical overload. VITROHM also offers power SMD-resistors with metal band, wirewound, and film technology for current sense purposes, power, and precision applications. Series RWF and RWS for circuit-protection are also available. Rectangular size 5020 for automatic placement. 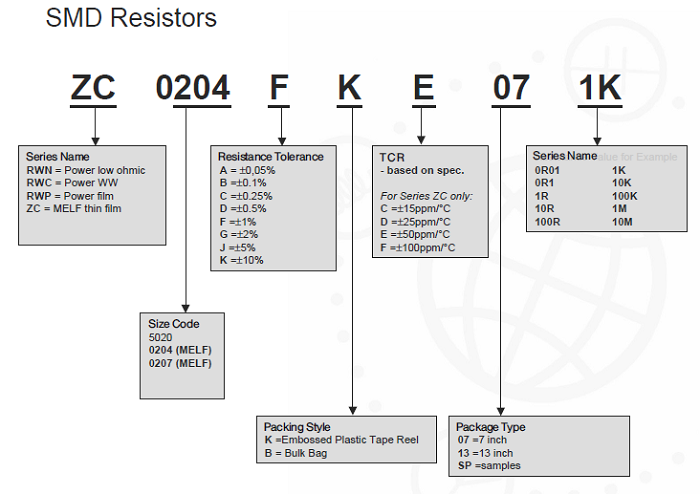 For many electronic applications (switch controllers, switch-mode power-supplies, frequency converters) induction-free resistors featuring very low ohmic values are needed. VITROHM offers a resistance range from 0R0005 to 3R3 and power ratings from 1W to 10W in several styles. IBS Electronics operates a seamless global network with offices in Asia, Europe, and the Americas. We offer quality, original components at a low cost to you. Additionally, our easy shipping process ensures you receive your components promptly. Do you need a custom solution for a project with unique specs? We can work with design engineers to come up with custom components. Contact us today for your procurement needs. For low to medium rated power (1W...8W), VITROHM offers wirewound resistors, which are coated with a special silicone-varnish that withstands temperatures of 350°C continuously. Axial and radial styles are available. Series CRF is designed for safety applications, connected to mains-voltage. Types CRT100 and CRT200 Resistance Range 1R up to 200R Rated Power 1W and 2W. Withstand up to 2[KV] surge voltage. For medium to high rated power (4W...40W), resistors are mounted in a ceramic case, which also provides full electrical insulation. Axial, radial and vertical styles are available. Series KT and KF additionally provide a thermofuse, which will interrupt circuit in case of electrical overload. Series BW and BWF, wound on fibreglass core and capped in a special process, suit all requirements for automatic insertion due to moulded case. The accurate fusing characteristic of series BWF reliably protects circuits from electrical overload. Power SMD-resistors with Metalband-, Wirewound- and Filmtechnology for current-sense-purposes, power- and precision- applications. 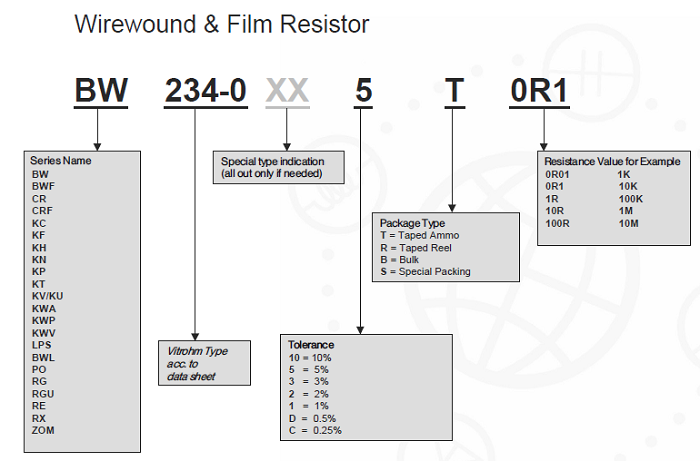 Series RWF and RWS for circuit-protection also available. Rectangular size 5020 for automatic placement. Melf- and Minimelf- Metalfilmresistors, tight tolerances, low temperature coefficient. For many electronic applications (switch controllers, switch-mode power-supplies, frequency converters) induction-free resistors featuring very low ohmic values are needed. VITROHM offers in it´s today´s programme a resistance range from 0R0005 to 3R3 and power ratings fro 1 W to 10 W in several styles. Base-metals like Tantalum and Tungsten (RG/RGU, metalglaze) and Tinoxide (PO, metaloxide) render performance to these series´ which are hardly found with other filmtechnologies. RG/ RGU (axial/vertical) with their capless soldered internal contacts and their thick-film elements provide highest reliability even under difficult environmental conditions. Metaloxide resistors series PO make film technology available to power applicaions because of their wide temperature range and their pulse-capabilities, which are high for film resistors. Power Metal Film Resistors series PF are from thinfilm technology based on NiChrome-alloys, and offer small sizes, good stability and acceptable pulse-load-capabilities. The price / performance ratio is very good. Wirewound Resistors for high power-rating up to 250W with chassis-mounting. Brake resistors with easy-to-mount aluminium housing and flexible leads. UL-approved version also available. Brake resistors with easy-to-mount aluminium housing and flexible leads. UL-approved version. Cement coated wirewound resistors wound on oval ceramic body for screw mounting or radial soldering pins for PCB mounting. Vitreous and cement coated wirewound resistors, wound on round ceramic body and connectors.